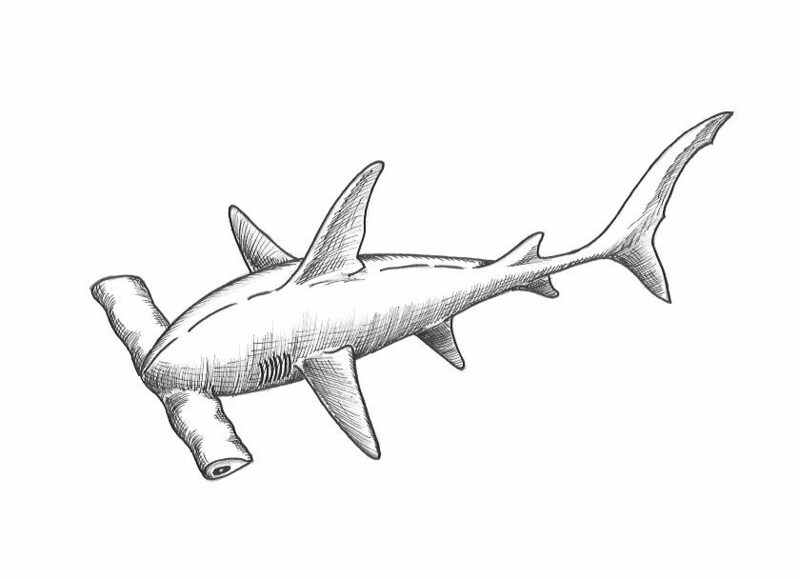 In this follow-along-tutorial, I will show you how to draw a hammerhead shark. These beautiful sharks are some of the most iconic sea creatures known to man, and I think it’s safe to say that everybody with the tiniest interest in the ocean and it’s dwellers, knows of hammerhead sharks. No surprise then, that anybody with an interest in sea creatures, and/or drawing, would want to have a go at drawing one of these magnificent animals. I know I do! Fortunately this is actually not particularly difficult, and I am here to show you how. I am using the book “How to draw 50 sharks, whales and other sea creatures” by the late, great Lee J. Ames as my reference. This is a great book, that I highly recommend. His instructions are quite sparse, though. This is the reason why you might find it easier to follow along with the video. Or perhaps using a combination of both is the way to go… Whatever works for you. To get a little taster of the process, and perhaps also a splash of extra motivation (we all need that from time to time, right?!? 😉 ) I have included a very quick video. The whole thing in 58 seconds! If you want, you can watch that first. Or you can just jump straight into the full follow along tutorial further down the page… It’s completely up to you! 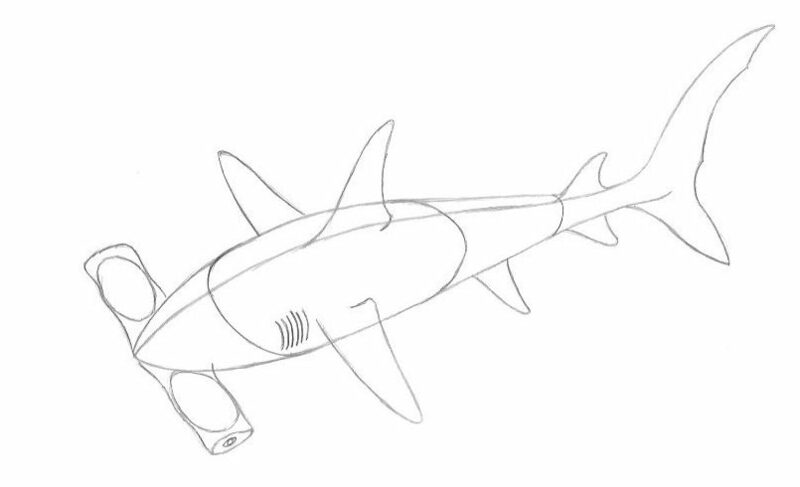 Below I’ve done a quick run through of the basic shapes you’ll be drawing, as you’re building up your shark. This is my take on the process, and it does differ slightly from the book. -Just follow along with the video further down the page, and then refer back to the drawings as needed. And of course the steps as I’ve played them out are only suggestions. You can obviously jump back and forth as much as you like! Add the basis for the fins, the tail and the hammer. Complete all the shapes. Add the gills. In addition to learning this particular drawing, I’m hoping this will also give you an idea of the kind of three dimensional thinking you should be getting used to applying, in general, when drawing. The 3D effects are really not that complicated to get into your drawings, once you start grasping the basic concepts, but they make a huge difference in the end result! So it is absolutely something that is worth a little effort. I’m hoping you got something out of this. I hope the instructions were clear, and that the video made sense. And as always, I’d love to hear from you, so please leave a comment. Maybe you have a suggestion on what to improve or do differently? I’d love to hear it. Maybe you have a wish on what you’d like to draw? Post it below, maybe I can help? I know I’d love to try! Happy drawing, and remember that drawing is a skill – Let’s learn it! Great video and tutorial. I am not skilled in the drawing area at all so getting to see it from start to finish as well as the tips to incorporate 3D effects. I would not have thought of doing that and maybe that’s why I can’t draw haha. I think what always confused me more with drawing is the shading aspect. Any tips or videos on proper use of shading or how to do it correctly? Glad you liked it, and it made some sense to you. The 3D effect is probably not the most important thing to think of, when you’re first learning to draw, the basic shapes come first. 😉 But it is definitely something that is relatively simple, and can take your drawings to the next level. For the shading, the first tip is really to identify your lightsource, and do your shading on the opposite side of that. I don’t have a specifik lesson on that yet, but it’s a great topic! It’s going in the notes, for future posts to make. 😉 For now, take a look at this post: The featured image gives a decent illustration of that point. Thanks for the visit, and thanks for the comment! Oh wow! I am so bad with drawing so this is perfect site for me! The way you are showing how to draw is incredible. I’m going to draw this shark later today, let see what kind of art I’m making with little of your help 🙂 I would like to see how you are drawing a human being, would that be possible you to share? Thanks so much for the kind words. And I am very happy that you found the instructions useful. 🙂 Remember to cut yourself some slack in the beginning, and just take your time with it, and of course have fun! Thanks to your extremely educational way of demonstrating how to properly build a drawing from scratch, I think I’ll be able to learn now! I appreciate you taking the time to create this. Thank you! I drew a lot as a kid, but then forgot all about it for years. And then I wanted to pick it up again for a long time, but just had the hardest time committing (for the before mentioned reason) That’s actually what eventually got me to start this website. I figured I needed something to keep me accountable. And one of the main points that I am trying to convey, is that drawing is a learnable and teachable skill. It only takes a little direction and some practice, and this is what I am gathering here. So there’ll be lots more great (FREE) resources coming. Thanks for your kind words, thanks for the visit, and thanks for the comment! Hey Michael, love your article on how to draw a hammerhead shark. It is nice to see you incorporated some YouTube videos with the article. It is well laid out and your website is great. I checked out your website and it is awesome. Keep up the great work! !